Have you ever cried tears of frustration in your trailer after a run, knowing deep down that you had the potential to achieve so much more? After years of hard work and dedication, do you still experience the painful disappointment of clocking a second (or more) off? If YOU are driven to be the best, and want to train barrel horses in a way that achieves real, lasting, positive results – then you’re in the right place. 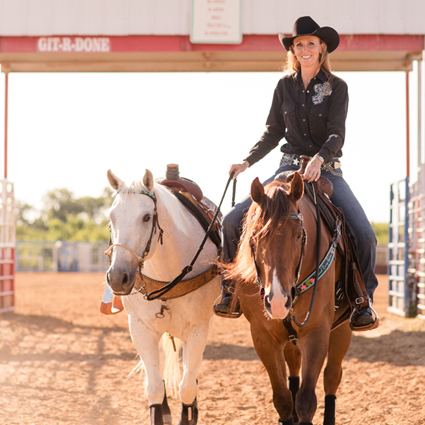 I’m Heather Smith, and I help barrel racers WIN – in the arena and in LIFE, with one-of-a-kind resources for developing educated, confident, high-achieving equine athletes. Starting at a young age, my need for speed was evident. It was all fun and games until my pony randomly delivered that speed at inopportune times without regard to my wishes. Then, at six years old – the crash occurred. The one between my forehead and a tree that left me lying motionless on the ground. Except for my pony Freckles, munching on grass a few yards away, I was alone. Perhaps something shook loose(er) in my brain. Why else would a little girl whose childhood adventures resulted in scars (Freckles often tried to rub me off on barbwire fences) and concussions, keep coming back for more? Even before that incident, it was clear that I was different from others, and not just because I was a feisty redhead. When people called my pony “stupid” for her dangerous antics, I wasn’t convinced. I actually believed she was smart, and I told them so. In fact, to this day, I’ve never met another horse who could contrive such a variety of effective ways for removing a person from their back. When Freckles was successful at dumping me, she was rewarded with some peace and grazing (until I regained consciousness anyway). Back then, we were each only concerned with meeting our own individual needs. Freckles was highly intelligent, and I was fiercely determined – but her ideas and my ideas were NOT the same ideas. If Freckles could use her mind and body in a way that was in agreement with what I asked, rather than in opposition, we’d be getting somewhere. Ever since those early days, I’ve dedicated my life to learning AND teaching how horses & humans can come together in mutual agreement to achieve great things (with speed, of course). Over many years, and many more horses, I honed my abilities through starting colts, training performance horses, and competing successfully in both reining and barrel racing. Transforming troubled horses with less than ideal pasts into successful athletes provided profound learning experiences. I’ve enjoyed opportunities to learn from, study and ride with some of the industry’s greatest horseman including Ray Hunt, Buck Brannaman, Les Vogt, Clinton Anderson, Pat Parelli and David Ellis, as well as many top barrel racing clinicians, NFR Qualifiers and World Champions such as Ed Wright, Marlene McRae, Lynn McKenzie, Kay Blandford, Molly Powell, Charmayne James, Jane Melby, Mary Walker, Lisa Lockhart and Michele McLeod. The many obstacles I encountered on my journey only fueled my unrelenting tenacity to overcome them. Eventually feelings of frustration were replaced with satisfaction and accomplishment. However, it wasn’t until after I had been riding for more than 30 years and been a very serious, successful competitor and student of horsemanship, that I realized just how many critical pieces I had overlooked. As I began to really understand horses, I looked at them with new eyes. I found true success hidden in the tiniest details, and was amazed by how subtle changes took everything I did with horses to a whole new level. My travels have taken me from humble beginnings in the farm country of North Dakota, to Wyoming and now central Texas where my husband and USTRC Reserve World Champion header, Craig Smith and I call home and compete professionally. 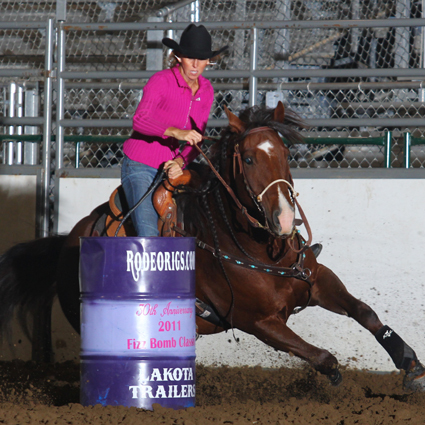 YOUR path to barrel racing success doesn’t have to have the speed bumps and delays mine did – I’d love to show you how. I can help you give peace to troubled horses, create positive, confidence building experiences for youngsters, develop high-level, competitive equine athletes, and bring out the very best in individuals with varying athletic tendencies and personalities. When I look back, I’m actually grateful for my horsemanship hardships because they prepared me to help others achieve success much quicker and easier. I see now, that the hard road had a purpose. Continuing to train, compete, and help YOU reveal the winner within, is it. There two primary ways I’m currently working with and offering resources to barrel racers. Here at BarrelRacingTips.com, I place a heavy emphasis on quality horsemanship to prepare our equine partners mentally, physically and emotionally, with the goal to develop happy, healthy and competitive equine athletes. It’s been my experience that true barrel racing success is difficult, if not impossible to create without a strong and integrative trio of these foundational elements. 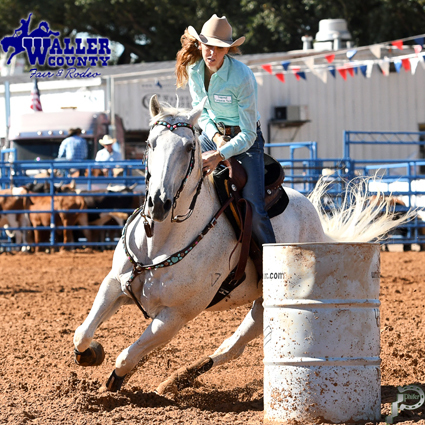 With an open mind, a commitment to personal development, and a focus not just on what you want to achieve, but how, PLUS the right guidance and support – YOU CAN turn YOUR barrel racing dreams into REALITY. I’d love to help you do that! So sign up below to keep in touch. Get Inspired and Take Action with Heather! You’ll receive my weekly barrel racing tips and I’ll also send a copy of The Guide to Independence on the Barrel Pattern featuring 12x NFR barrel racer, Kay Blandford – my treat! To learn even more about what’s offered at BarrelRacingTips.com (and why), click here. For sponsorship or endorsement opportunities, see the My Partners page. For any other inquiries, including media bio and photos, please visit the Contact page.